LG has announced the availability of a trio of new featherweight LG gram laptops. Each size comes in two different variations, all of which promise much improved battery life despite their thin-and-light nature. 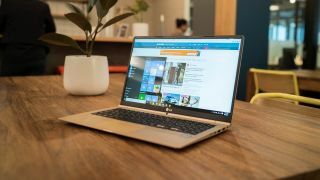 The most compact notebook is the refreshed LG gram 13Z970, a 13.3-inch laptop which weighs just 2.07 pounds (a smidge under 940g). The hardware consists of an Intel Core i5 processor (Kaby Lake) backed with 8GB of memory and 256GB of storage, with two variants: one model has a non-touch IPS Full HD display, while the other has a touchscreen and fingerprint sensor. Battery life is 17.5 hours on the former and 15 hours for the touchscreen version, with pricing set at $999 (around £800, AU$1,300) and $1,099 (around £880, AU$1,430) respectively. Moving on up, the LG gram 14Z970 is a 14-inch machine which again has two different models. One sports an Intel Core i5 CPU and the other ups the ante to a Core i7, and that’s the only difference. Both models have 8GB of system RAM and 256GB of storage along with a touchscreen. They offer 14.5 hours of juice and weigh in at 2.14 pounds (970g). The Core i5 machine retails at $1,199 (around £960, AU$1,560), with the beefier i7 version pitched at $1,499 (around £1,200, AU$1,950). Finally, we have the 15.6-inch LG gram 15Z970, which has a weight of 2.4 pounds (1.09kg). The base version of this laptop has an Intel Core i5 processor, 8GB of memory and 256GB of storage, with a non-touch display. Or you can opt for the Core i7 model, which doubles up the memory and storage (16GB/512GB) – plus it adds a touchscreen. Battery life is 15.2 hours for the former and 12.5 hours for the beefier model, and pricing is $1,199 (around £960, AU$1,560) and $1,699 (around £1,360, AU$2,210) respectively. Other noteworthy points across all models include the presence of a USB-C port, a backlit keyboard, and a "daylight mode" to make the screen brighter and more easily visible outside – though, the latter isn’t present on the largest model. You can purchase these notebooks at retailers across the US right now, including the likes of Amazon, Fry’s, B&H, Microcenter and Costco. However, we're awaiting information on availability in the UK and Australia, and will update this story once we hear back. Will the new LG gram make it onto our 15 best laptops list?